From an e-commerce marketplace, Snapdeal is evolving into a larger online marketplace. The company announced on Monday it is entering into the “$100 billion” (roughly Rs. 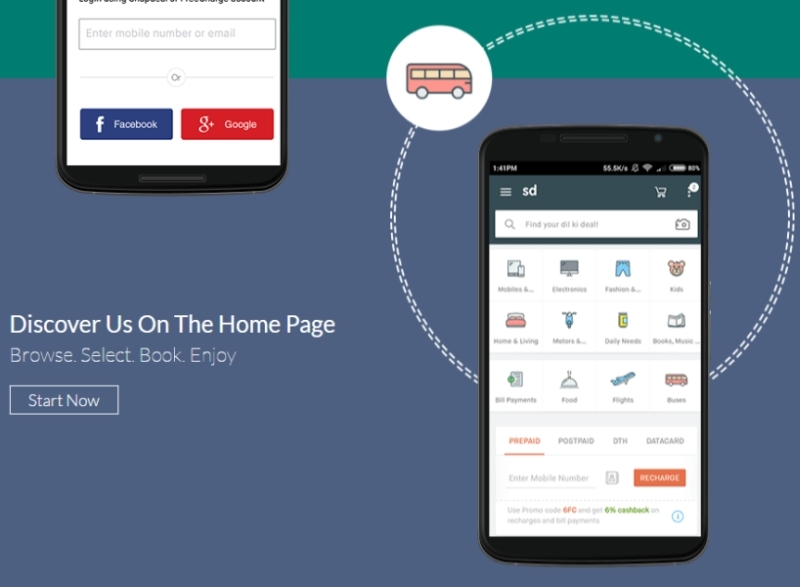 671954 crore) market for online services starting with flight and bus ticket bookings. Snapdeal says that it has partnered with Cleartrip, redBus, UrbanClap, and Zomato, and will be providing flight tickets, bus bookings, personal services, and food ordering through its platform. Although Snapdeal is increasingly sidelined by most people analysing the e-commerce space in India, who focus on Flipkart, Amazon, and the spectre of China’s Alibaba, Snapdeal remains one of the biggest online companies in India, and it has reinvented itself in the past, transforming from a Groupon-type of couponing service, into one of the first e-commerce marketplaces in India. “We are confident that the introduction of services on Snapdeal will bring us closer to our goal of 20 million daily transacting users by 2020,” he adds. At a time when common wisdom is that companies are finding it harder to get funded, Snapdeal is trying to create a something-for-everything platform that will appeal to the maximum number of users. At the same time, Snapdeal’s former Chief Product Office Anand Chandrasekaran had described a “string of pearls” strategy within the company, to create a numer of businesses that would supplement each other and help drive traffic between different platforms, such as Freecharge, Shopo, or Exclusively. Does Snapdeal’s increased focus on a wide platform mean that the string of pearls strategy wasn’t working out? The announcement came soon after some major executive changes in the company;FreeCharge reshuffled its top management in May, and Chandrasekaran’s exit from Snapdeal was announced the same day. “Services and products come together to make the user experience complete and we are excited about the possibilities through our joint effort,” adds, Varun Khaitan, co-Founder UrbanClap.